Just Jingle: A Fresh Squeezed Christmas GIVEAWAY! Hello, friends! Happy Friday!!! I have some fun for you today! I was recently fortunate enough to win a super cute kit from Paper Made Bakery featuring, of course, Fresh Squeezed Stamps! I got a chance to play with the kit a bit last night and had LOTS of fun with it! I want to share a couple of the cards I created. 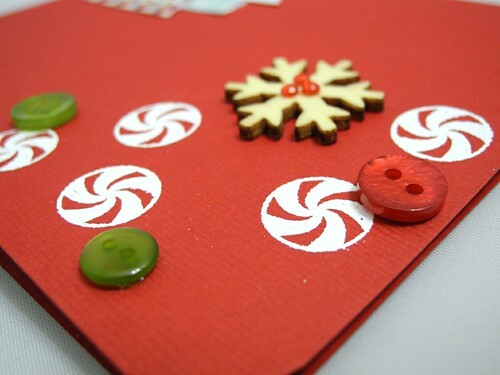 For this one, I stamped and embossed the candy first and then surrounded it with fun buttons and the awesome wood veneer snowflake from the kit. I am SO IN LOVE with wood veneer accents right now!!! I created a sentiment banner and cut strips of the patterned paper to look like washi tape for layering with the sentiment. FUN! I don't often use textured cardstock on my cards, and I so enjoyed this beautiful red textured paper! It's so pretty! For this one, I confess, I added some Martha Stewart paper tape...it was NEW!!!! I couldn't help it! LOL! It also went really well with the Lily Bee paper and the colors I wanted to use on the gumdrops! YAY! I love the multi-colored twine that came in the kit! So cute! AND...it just so happens that I already owned the adorable stamp set, Christmas Treats, that came with this kit, SOOOO... I am giving one away to one of you today! 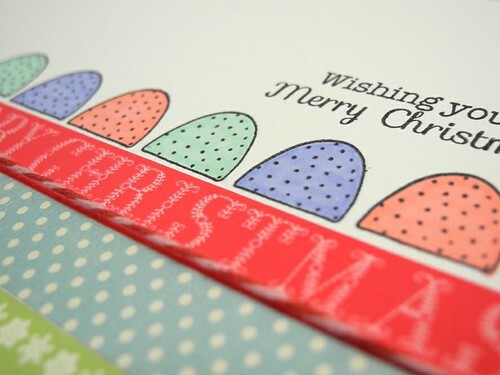 One Just Jingle reader will win this fun Fresh Squeezed Stamps Christmas Treats set! Please see the Rafflecopter Widget below. If you are in a reader or an email, you will need to click through to enter! These are so happy and nice! I have this ANCIENT picture from my childhood out of some magazine where they decorate a white tree with nothing but candy! I always wanted to try that. Haven't done it, but your cards bring back the memories! Thanks for that!! What darling cards. I love the stamp set. Thanks for the chance to win. Thanks for the chance to win Jingle! Super cute cards and thanks for the chance to win!! I absolutely love this stamp set! Great job showcasing them! Awesome stamp set! Thanks for the chance to win it. I love their subway art stamps! Gorgeous and super happy cards, love them!! Girl! Just love the cards! Don't you just love the paper tape? Thanks for the chance! I really love this stamp set! Love the stamps. Super cute gum drops. Thanks for the chance!!! Oh Oh OH or should I say HO HO HO..hehe!! I LOVE the peppermints and the snow flake. Oh wait...I love the gumdrops too. Both are AWESOME!!! I love when you get new things to play with...we all WIN by getting to see just how creative you are. Love what you've done with this set! very cute cards..love those gum drops..
thanks for the opportunity to win this awesome stamp set!! These are adorable but what else is new! Your cards are always just the cutest! You rock CAS, Lady friend! 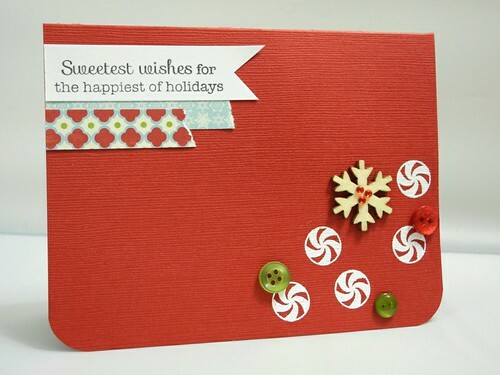 Love the cards-the veneer snowflakes are my favorite! And the Happy Hexagons are my favorite stamps! Another great card! Love me some wood veneers and the snowflake is of course perfect for winte! This stamp set is very cute. My favorite is the first card with all the details. Cute stamp set. Love the apothecary jar! This set is super cute. I always live your cards. No e captions! You KNOW I'm already a huge fan of your creativity!! Freshly Squeezed stamps are so fun and whimsical. My favorite would definitely be this holiday set! These are so cute love the colors on your second card! I like the Tickle my fancy stamp set, so pretty! Thanks! I love the stamp set and I also love the tickle my fancy and winter wonderland in her shop! Your cards are fabulous of course! thank you! I think my favorite is hard to pick. But, I sure LOVE the Christmas Treats set and would love to win it! LOVE your cards, too! These are all just too cute! Cute cards and a very fun set! Thanks for the chance! What a fun stamp set. I can see you had a good time with them making your happy card. I have no idea what I just did but I think I entered, lol. Two fun cards with great designs! I love the gum drops! Love these stamps!!! Thanks for enabling!!! I really like Tickle my Fancy from the new releases. The feathers are just adorable. As are your cards. I especially love your red card! I love your card with the gum drops!! I am in love with Gingerbread items and love the stamp set!! I love the feather set! And I love your cards, always! 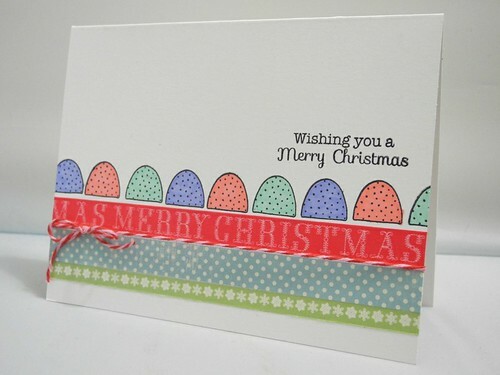 This is a lovely christmas card! simply beautiful. Keep stampin! Here's my warm christmas wishes for you this 2012, for you and your family.